Extra-clear glass flooring uses tempered, low-iron glass structural interlayers. At 1450 ft tall, the Willis Tower (formerly Sears Tower) in Chicago is the tallest building in the West- ern Hemisphere. Now it gets a further distinctionas host of a 103-story-high, all-glass visitor attrac- tion called “The Ledge” where adventurers can step out into the sky for a heart-pounding view of an ant-like streetscape nearly a quarter mile below.The Ledge is part of the already well-vis- ited Skydeck at the Willis Tower. Since The Ledge opened in July, thousands of people have enjoyed the thrill-seeking experience each day. Visitorscan enjoy the experience safely because it was constructed to bear five tons of weight.The Ledge consists of two separate boxes jutting a little more than 4 ft out past the edge ofthe Skydeck facade, creating a gravity-defying view that’s sure to thrill those who dare step out onto the glass floor. Strength of the all-glass construc- tion comes from laminated glass, a multilayered sandwich of glass and clear adhesive interlayer sheet material that holds the layers of glass to- gether. The laminated glass is assembled using minimally obtrusive framing, with bolts through the glass holding it to a retractable structural rail. 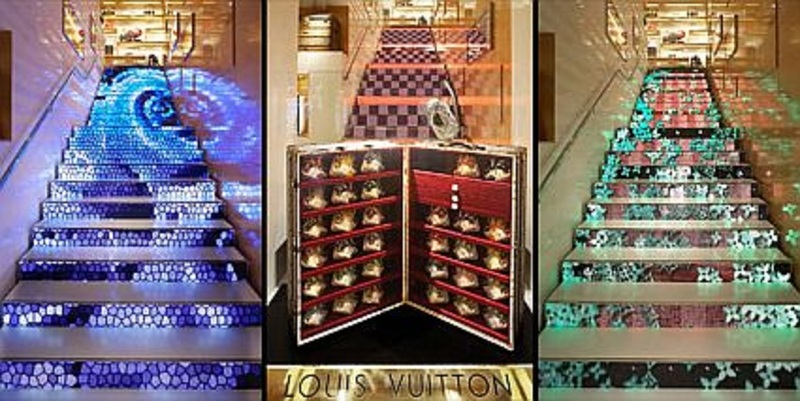 Three flights of plasma video stairs were created as part of Louis Vuitton’s new flagship store at the Landmark in Central Hong Kong. 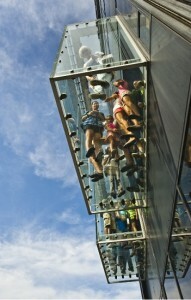 The animations feature figures climbing, descending and traversing the stairs. On 1st November 2005 the renovated and much-anticipated ‘Top of the Rock’ observation deck at the top of New York City’s famous Rockefeller Center re-opened to the public. The centerpiece of the project lies with the reopening of an extraordinary city observatory, some 260 m (853 ft) above the sidewalk of 30, Rockefeller Plaza, on the 67th-70th floors of the building. The observation deck was first opened in 1933 but had been closed to the public since the 1980s. It has now been fully revitalized using 465 m2 (5,000 ft2) of large, freestanding panels or balustrades of laminated glass containing DuPont™ SentryGlas® Plus structural interlayer that specialists say are at least 20 percent thinner than any other glass construction tested. Thomas Furman, project manager with SLCE Architects of New York City said: “The objective in using these unique and very large laminated glass balustrades was to provide a safe and secure viewing experience for all visitors to the observation deck and the Rockefeller Center, while maintaining the thrilling experience and expansive, 360-degree views afforded from this unique and historic viewing platform, located 70 stories above Manhattan. “The laminated glass installation consists of freestanding panels, cantilevered vertically up to three meters (10 feet) tall, with all supports and connections hidden below the walking surface of the roof. There are no clips or connections between the panels except at the corners. 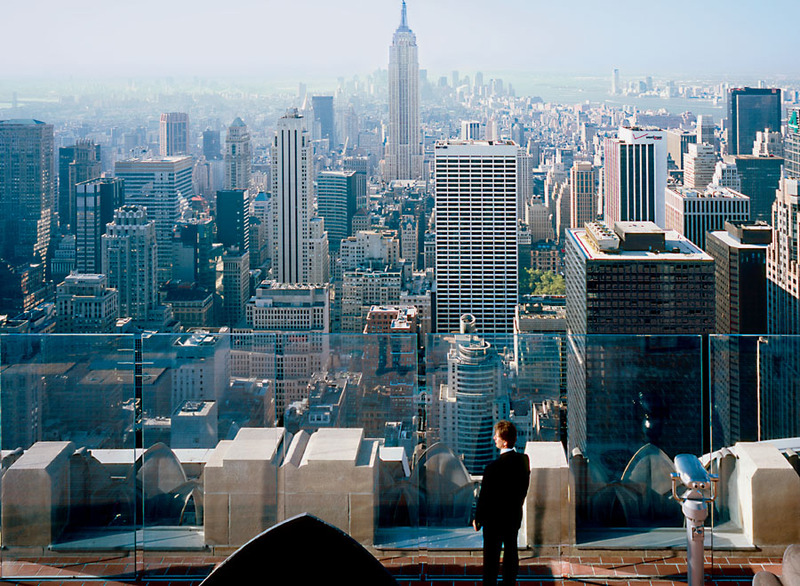 This allows the laminated safety glass assembly to be a perfect backdrop or frame for the views, as opposed to an obstacle. “The decision to use laminated glass with SentryGlas® Plus came out of discussions with glazing contractor W&W Glass, LLC of Nanuet (NY), and exterior wall consultant Israel Berger & Associates of New York. They advised us that the use of SentryGlas® Plus would solve many important challenges regarding the structural complexity of the laminated glass panels, our desire for absolute clarity of vision and the need for minimal reflectivity. Architects today want more glass in buildings. The laminated glass technologies we have now means they can have that safely, and with a freedom unimaginable 10 years ago – whether in terms of structural strength, colors and decoration or delicately varying degrees of translucency, with the lovely effects this brings. Architects also love using new laminated glass compositions with interlayers such as DuPont™ SentryGlas® Plus because it allows them to use thinner, stronger glass constructions in lighter, clutter-free fixing systems like point-fixed glazing – which makes the glass, for all its strength, seem invisible, often making any barrier between inside and outside melt away and opening up the building to natural daylight to the maximum. What’s interesting / new on the market? New interlayer technologies, again because they help to stretch the envelope of what can be achieved with glass in buildings. Architects are generally slow to adopt new technologies, preferring to take a ‘wait and see attitude’, but the quite significant new structural strength properties of the interlayer are becoming more apparent with every project it is used in, throughout the world. At Cricursa, we are beginning to understand that the use of SentryGlas® Plus with annealed glass can complement or even obviate the need for the strength of tempered glass in a laminated construction needing high strength. This new type of laminated construction also brings the overall weight of the glass down, more good news for architects who want to use very large panes of glass in their façades; the whole façade weighs less and needs a less cumbersome support system. Part of the structural support is coming from the interlayer itself, which is a very interesting concept. 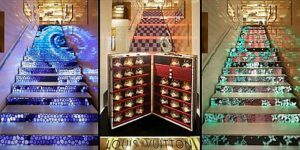 Today’s lamination technologies have helped architects apply glamour to glass! And it’s not only the aesthetics of the material that attracts the architects and the building industry; today’s laminated glass works much harder than anyone could have imagined 10 years ago to meet a range of functional needs – from demanding wind load requirements in high rise buildings throughout the world, seismic loading where this is needed, or impact resistance in typhoon or hurricane regions.The marriage of glass with metal has also captured the imaginations of many architects because of the astonishing visual effects achievable when you laminate glass to metal mesh, and also because of new fixing possibilities if you can glue metal fixings right into the SentryGlas® Plus structural interlayer – as Apple did for the Apple Store in SoHo and, following the success of that project, for an evolution of similar staircases in subsequent stores. Most of all, I believe that architects are fascinated by the new ways to control light that laminated glass gives them: by building in various degrees of opacity; by using Low E coatings to control shading very tightly and by the use of colors of decoration within glass, for example. The architects we work with worldwide are very interested in decorative technologies like Expressions™ decorative technology as an efficient and flexible new way of introducing a whole new range of visual possibilities into laminated glass. Today, I would no longer say that architects from one continent want this or work that way while architects from a different continent work another way or want other things. The architects we work with are very spread out geographically. European architects work in the USA; U.S. architects work in Europe; Japanese architects work in Europe. They are hardly ever to be found in their home office! And a trend I see is that each major city across the planet wants its signature building, and almost by default this has to be designed by an architect from a different continent! Perhaps because an architect from elsewhere gives a refreshing new perspective to the assignment. As for the future of laminated architectural glass, that depends on which gifted architect walks into our office tomorrow! We are always honored to be working on new architectural laminated glass challenges that go to make incredible buildings, all over the world.